Arnulfo Acevedo “Nino” Espinosa was born August 15, 1953 in the Dominican Republic. 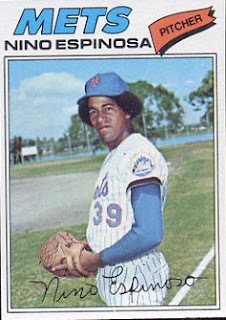 The tall six foot right hander was signed by the New York Mets as an amateur free agent at age 17 in 1970. In 1973 he was 10-10 leading the A ball Visalia pitching staff (tied with Nardi Contreras) for the lead in wins. In 1974 he was 9-8 with a 3.42 at AA Victoria & a few weeks after his 21st birthday he got the September call to the big leagues. 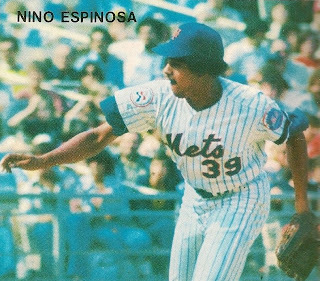 Espinosa made his MLB debut on September 13th 1974 in a start at Shea Stadium. He pitched seven shutout innings against the Chicago Cubs, before allowing three runs in the 8th inning. He left the game tied 3-3 but the Mets lost it when Bob Apodaca served up an 11th inning HR to Ron Dunn. He made one more relief appearance on the year. In 1975 he got called up in July and pitched in only two games. His first appearance was two scoreless relief innings against the Chicago Cubs. Then on July 5th he allowed six earned runs over three innings pitched in the second game of a twin bill at Philadelphia. He went back down to AAA Tidewater going 8-5 on the year, posting a good 2.62 ERA. In 1976 he was 7-3 at AAA Tidewater getting called back up to the Mets staff in July. When he returned he dropped his old uniform #43, & took over Gary Gentry’s old #39. In his first game back he allowed two runs in the 7th inning and lost to the Atlanta Braves 5-3. On August 1st he pitched seven innings against the Phillies but gave up a two run HR to Mike Schmidt. The Mets were shut out by Wayne Twitchell that day. Espinosa got two more starts & won them both beating the Pirates & Reds both good hitting teams. He finished out the year mostly pitching out of the bullpen. He appeared in 12 games for the third place '76 Mets, going 4-4 in with a 3.67 ERA, striking out 30 batters with 13 walks in 40 innings. By 1977 the Mets were in major transition and the staff was hurting. Espinosa started out the year winning his first decision in relief, benefiting from a Joe Torre game winning double. In his next win Espinosa pitched a complete game 2-0 shut out at Shea Stadium to beat the Chicago Cubs. In May he then lost four straight decisions before winning two games in June. He went 1-3 in both July & August as the Mets fell deep into last place. On August 9th Espinosa pitched a complete game one run victory over the Cardinals at Shea. In September he threw four more complete games including his best performance on September 14th. That night in Philadelphia he shut out the first place Phillies with a three hitter. He also drove in the only run of the night with an RBI single. He had another fine night on September 27th, as he allowed one run (unearned) beating the Pirates n Pittsburgh with a four hitter. For 1977 with the one of the leagues best afro's, he led the club with ten wins (10-13) & had the best ERA among the starters (3.42). Espinosa was a work horse throwing 200 innings with 29 starts, both second on the club to veteran Jerry Koosman. He made 32 appearances overall with 105 strike outs, 55 walks, seven complete games & one shut out. In 1978 he beagn the year getting knocked out of the second game of the year allowing three runs to the Montreal Expos. The Mets did go on to win that game 6-5. He didnt earn his first win until May 10th when he pitched a 7-2 complete game win against the Expos in Montreal. Espinosa won four straight games that month, three of them complete game performances. In June he started out at 5-2 but then lost four straight, falling to 5-6. In Montreal on June 20th he tossed a four hit shut out striking out five Expos.A good July had him go 3-2 pitching seven innings or more four of five times. A horrible August had him lose four straight giving up four earned runs or more in three of four starts. On September 7th he pitched another complete game win & had some run support in the 9-4 Met win. On the year he led the Mets staff again with 11 wins but also led them with 15 losses (third most in the NL). Espinosa allowed a league leading 107 earned runs, giving up 24 HRs & 230 hits while posting a 4.73 ERA. He started 32 games & pitched over 200 innings once again for the third straight year. In Philadelphia in Espinosa had a career year in 1979, winning 14 games (going 14-12) with a 3.65 ERA, pitching 212 innings with 32 starts, & throwing three shutouts. The next season he had arm troubles and didn’t pitch until early July. He went on to go 3-5 on a Phillies team that went on to win their first ever championship. He did not pitch in the post season. In 1981 he went 2-5 in 14 games before getting released at the end of August. He then signed with the Toronto Blue Jays where he only pitched one game as Injuries cut his career short by the age of 28. In an eight year career he was 44-55 with a 4.17 ERA, pitching in 820 innings striking out 338 batters, allowing 380 runs with 252 walks. Retirement & Passing: After baseball he lived in the Dominican town he grew up in. Tragically on Christmas Eve 1987, he suffered a fatal heart attack at the young age of 34. While the Mets were understandably impatient with Nino,he was too young and talented to spare for the older and overrated Hebner.Nino,like Nolan Ryan,was a victim of both the Mets coaching staff's inability to harness a raw pitching talent,and the organization's desperation to try anybody new at 3rd base -with Hebner and Jim Fregosi being 3rd basemen.Clueless Joe McDonald can claim vindication as Espinosa's career went into rapid descent in 1980,but it would've been a pleasant memory amid the bleakest in Mets history to see a farmhand have his best year in the uniform he was born in.Instead,the back of Hebner's hand is what I'm left with.